While we were gone on our trip, a pot of unintentional seedlings grew quite a bit. We don’t intentionally try to pollinate our Coleus, on the contrary, we try to remove all flowers or buds as we see them. However some will slip by us, and one pot of perhaps a sadly deceased coleus (probably because we let it go to seed) started showing signs of life this spring. 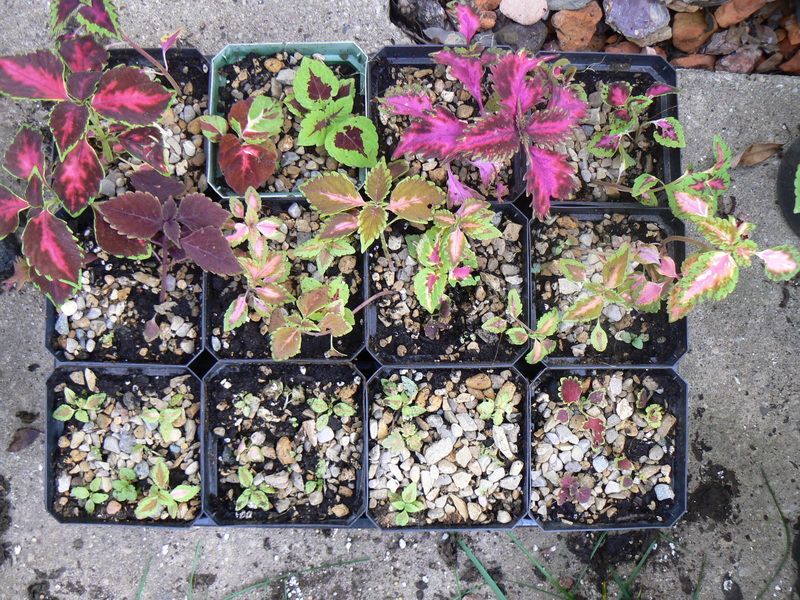 We kept the seedlings and let them grow, and it seems like they are quite a mixed lot. I don’t even know who the mother plant was, but it sure looks like lots of fathers were involved. Take note of the amazing hot pink cell, top row, second from right. Quite spectacular. Hybrids are fun!